I've talked about buying from Target.com before, but I made a new order tonight and I have a little extra information here (hint- It's at the very end) so bear with me. My family spends a lot of money at target. At this point, we buy diapers and wipes for two sets of children and baby formula. All that adds up big. Target Red Card - 5% off and free shipping with no minimums. As I will explain, I pretty much never use this card anymore, but I still get the extra 5% discount. Taking Charge of Education - Pick your favorite school and Target will donate an additional 1% of your purchase to that school. If you have no school, please pick Jewish Heritage in Amherst NY. School ID 118518. They have a small budget so every dollar matters. 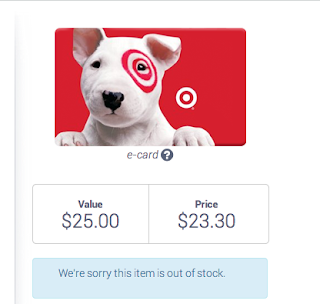 I am consistently checking giftcardgranny.com for discounted target cards, which is a aggregate site for websites that sell discounted gift cards. I will usually buy anything better than 4%, but let's assume 4%. Tonight I was able to buy it for 6.7% discount. Here is a picture of it after I already bought it. Top Cashback - Most of the time, GiftCardGranny will report that Raise.com has the best value. I know that if I go to Top Cashback first, I will get extra cashback. Right now it is at 2% so my 6.7% from Raise was really 8.7%. Paying at Target.com - my Target Red Card is connected to my Target.com account. I assume this happened when I saved the card for future purchases, but I'm not positive. Since the Red Card is connected, I get 5% off and free shipping even when I use a gift card for the entire purchase! I get the benefit of the Red Card without ever using it!. 10.2% has now become 15.2% with free shipping! Savings like a Boss!